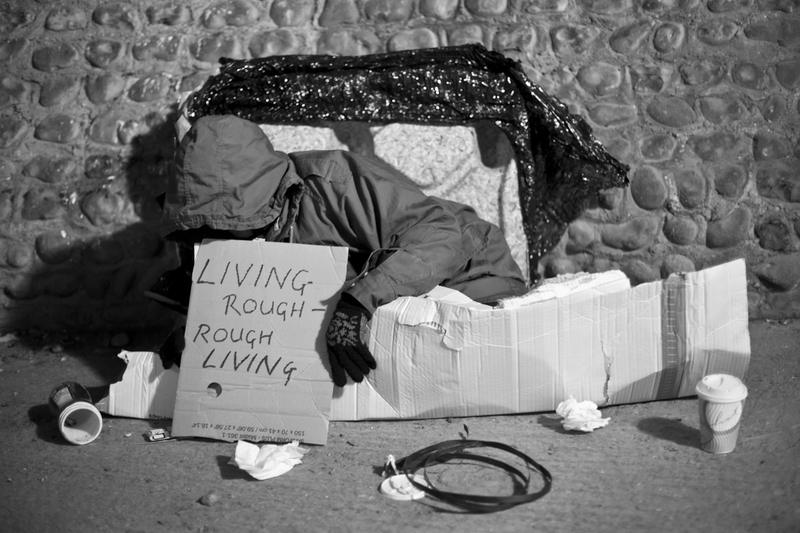 'Living Rough -- Rough Living' is an empowering collaboration bringing together a group of people who are homeless, have experienced homelessness first hand, sleep rough, live in emergency shelter or live, eat and sleep on the streets - some for one night, others for a life-time. The project originally started out during an outreach photography course as part of my job at City College Brighton and Hove, where I work as Photography Tutor at Phase One, a homeless hostel. We secured additional funding from community learning providers, to faciltate an eye-opening photography exhibition during Brighton Fringe Festival in May 2012. We have since progressed to 'Living Rough -- Rough Living' being published as a photography book launched as part of Brighton Photo Biennial / Brighton Photo Fringe Festival 2012, in response to this years theme 'Agents of Change. Photography and The Politics of Space'In an attempt to raise public awareness we worked closely with First Base, who provide a day centre for homeless people and rough sleepers to shower, eat breakfast, study courses and be signposted to relevant services. Over a six month period, as a form of community photojournalism, we lent out digital cameras, distributed disposible cameras, offered photographic training and creative support, whilst encouraging participants to express themselves either individually or within group sessions. We reached out to people in areas usually denied access to the creative arts and learning. We worked within an urban space that many people would never usually see, enter or experience. We gave the participants the tools and confidence to tip-toe into these somewhat territorial places, fully respect their peers need for privacy, allow them a voice to share their experience, ideas, thoughts and feelings; offering a platform to this marginalized group who are all too often socially and economically excluded. The end result is a moving, anonymous and faceless archive of photographs and text, produced during a period of economic depression whilst harsh changes snowballed in local housing policy. The viewer is put in the shoes of the homeless person, becoming the narrator by silently reading the text and images, seeing street-life like never before and entering the internal head space of the subject: All too soon recognising and realising how close to home the issues and realities of the homeless person are to the viewer and how photography and text are juxtaposed to mediate the plight of the protagonist.